Buildings, roads, bridges, tunnels… They surround us, exposed to all sorts of weather conditions and quite often lasting decades, even centuries. Those in charge of their maintenance face some major challenges when fixing inaccessible roads or cracked façades but they almost always find a way to bring them back to life. What is their secret? Epoxy resins are definitely part of the equation. Ever since they were discovered in 1936, epoxies have been present in the manufacturing of adhesives, paints and coatings, primers and sealers, flooring and other materials used in construction and architecture. In fact, the construction industry was, together with aerospace, the first to grasp the unique benefits of this polymer. If only they had been discovered 30 years earlier! With their anti-corrosive properties, epoxies could have prevented, for example, the need for several of the reconstruction works carried out to preserve the Tower of Drince, a symbol of the industrial prowess of the Orne Valley in France. 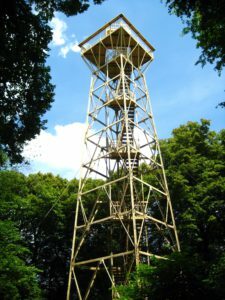 This tower, originally built in wood in 1904 and then turned into steel in 1932, has been restored more than once. In its last restoration in 2000, three layers of epoxy paint were used after replacing a number of elements (stairs, pillars and retaining cables). The municipality regularly visits the site to check for any deterioration. Surely the protective epoxy coating can be expected to keep the restorers away for many years. Some 700 km up north from the Orne Valley, in Berlin, epoxies are also making an important contribution to city maintenance. During the summer of 2017, a new innovative resurfacing technology using epoxy resins was applied to the city’s Rudolf-Wissell bridge. The longest bridge construction in Berlin, it spans 934m, and is an integral part of the motorway A-100. It is a highly frequented traffic way crossed by 220,000 vehicles each day. Originally built between 1958 and 1961, the bridge will be replaced by a new one in the future. However construction work will only start as of 2022 and may take several years to complete. Consequently the original needs a second lease of life to last until the replacement construction will take over the burden. The Berlin authorities chose a new epoxy-based technology to reduce traffic disturbance to a minimum at this busy traffic junction. The technology is called HANV which stands for “Hohlraumreiches Asphalttragegerüst mit nachträglicher Verfüllung” which literally translates into “Porous-Rich Asphalt Scaffold with Subsequent Filling”. Its advantage is that application of a porous base layer of asphalt and subsequent filling of the pores with epoxy resin significantly reduces downtime, thus minimising traffic disturbance for Berlin motorists. During the resurfacing project, 450 MT of porous base asphalt were applied to one direction of traffic for the whole bridge length covering a surface of 4600m². Shortly after the asphalt had cooled down to less than 60 degrees Celsius, 59 MT of 2- component highly reactive epoxy resin system were injected into the porous structure. After only 16 hours, the curing process had already advanced enough to apply the next layer of intermediate tie-coat, followed shortly by applications of the final layer of mastic asphalt and grit. Time-to-complete requirements of the municipal traffic department was significantly undercut, proving once more impressively the many benefits epoxy technologies bring to our daily life. These are only some of the many examples of how epoxies’ properties help us live in a more secure and long-lasting environment. Their application in construction and engineering, even in small quantities, is crucial for the 3.3 million European firms working in this sector because, thanks to them, they are guaranteed to have durable, outstanding results. Next time we see a restoration project under way in floors, ceilings, façades or structural elements, let’s think of how much maintenance work epoxies are saving. Read the full stories in Le Républicain Lorrain, BZ and Detail (Translations provided by Google Translate).